The 0.21 tournament has concluded! Many thanks to everyone for coming together and participating in our community. And thanks especially to all our server administrators, developers, organizers, and contributors for putting in their work, time, and passion to make this tournament possible. Despite a longer release cycle and later tournament start date, participation this tournament was high and competition among players and clans continued to be fierce. Read on for a chronicle of the many and amazing achievements players managed in this competition. The champion this year is Yermak with 7751 tournament points, 36 wins, and a 51% win-rate. Yermak is widely known for his tournament victories, having won the 0.19 and 0.18 tournaments, and was solidly in first place nearly the entire time. In typical Yermak style, he pulled off the lowest turncount victory in 12323 turns and had the highest scoring victory, a 15-rune win in 22898 turns. He additionally had an 11 win streak (ended when his Demonspawn Abyssal Knight failed to pillar dance a kobold with a short sword on D:1) held 11 combo high scores, and won 21 out of 23 possible Tier 3 banners! In other categories, Yermak had the 3rd 15-rune win of the tournament, a GrFi won 3 and a half hours in, and was the 3rd player to kill all 76 uniques. An unstoppable force this time, Yermak put in over 7 and a half days of play-time with 71 games played, averaging 10 hours 42 minutes per day! The silver medalist is Manman with 6862 points, 22 wins, and a 39% win-rate. Manman is the previous 0.20 tournament champion and won a closely fought battle for 2nd place this time around. He was the first player to get a 15-rune victory a mere 2 hours and 20 minutes in and most notably was tied with 3rd-place finisher mibe for the longest streak of the tournament. Their 20-win streaks broke the 18-win tournament streak record set by theglow all the way back in the 0.11 tournament of November 2012! Manman’s streak was ended by a lowly rat on D:1 as his Human Wizard tried to shout from the arrival vault and lure monsters over one at a time. The monsters refused to cooperate, as monsters often do. As mentioned, the battle for 2nd place with mibe was pitched, and Manman didn’t take the lead until the final days of the tournament, with the 200 points from that first 15-rune victory proving decisive. In the non-point-awarding categories, Manman’s GrFi had the second-highest AC+EV of the tournament with 82/46 AC/EV, aided by the Cloak of Starlight, the Ring of Robustness, and a +6 protection ring. Third place goes to mibe with 6785 points, 25 wins, and a 28% win-rate. mibe has played in many previous tournaments, including an 8th place finish in the 0.20 tournament. This time his aims were to captain the winning clan, which he did, and to break the tournament streak record with a 20 game or higher streak, which he also did! His 20 streak was the first ever to break theglow’s record, with the streak ending with the death of his Formicid Wizard to a sixfirhy summoned by an obsidian statue in a Volcano. Dying to a stationary monster on a record-breaking streak is almost unforgivable, but you helped the Dev Team find bugs in 0.21, so we forgive you, mibe. mibe also made a strong attempt for last win of the tournament, playing what we must assume is his signature combo of MiBe, getting the third-to-last win in one hour 17 minutes, just 5 minutes before the end. The first place clan was Knee Deep In The Bread, with mibe (captain, #3), Charly (#6), hellmonk (playing as dying5ever, #7), Sharkman1231 (#20), RBrandon, and Surr, scoring 22873 points and 83 wins. This clan had 3 top 10 players, 22 high scores (3rd most among clans), and maintained a solid lead from early into the tournament. They had a lock on streak points with both mibe’s aforementioned 20-win streak as well as hellmonk’s 15-win streak. Hellmonk’s streak was 3rd longest, is still ongoing, and had a different skill title for every win! Finally hellmonk had the 3rd-lowest XL win of the tournament, a SpAE won at XL 18. Clan member Charly contributed a 7-win streak, had the third-fastest turncount win, a DDCK of Makhleb won in 15497 turns, and was the second player with a 15-rune victory just 3 hours in. Coming in at second place was Gozag or Go Home, with Ge0ff (captain), Beargit (#4), Faldahar, Chobophobe, ranchugoldfish, and ToastedZergling, scoring 21509 points and 80 wins, and had 30 combo high scores, the most of any clan. This clan continued from the previous tournament, where it took 3rd place, with 4 of its 6 players returning. Beargit snagged the final win of the tournament for 100 points with a speedy 56 minute MiBe that ascended only 35 seconds before the end of the tournament! Beargit also got a 12-win streak (ended when his Merfolk Abyssal Knight took a Crystal Spear from an Ogre Mage in Vaults) and ranchugoldfish contributed a 9-win streak. Third place is awarded to Make Aus Servers pls, with Demise (captain), Manman (#2), Ultraviolent4 (#5), gorglomux (#12), Alcopop, and Doesnt scoring 19584 points and 70 wins. The Australian CPO server owner and admin Alex was away on extended travel at the start of tournament, but was able to set up 0.21 on that server by the second day, so many thanks to him for doing this. The initial lack of CPO meant some loss of points at the start of tournament for this clan, but they made a strong showing in the end. Ultraviolent4 had the second-fastest turncount win, a GnNe won in 14682 turns, as well as a 13-win streak (ended when his Naga Berserker got outdone by a D:1 Kobold armed with a mere short sword). gorglomux had the fastest real-time win of the tournament, a Deep Dwarf Fighter won in about 37 minutes (about 4 minutes off WR), and was the second tournament player to finish a Ziggurat. tidbits had the 2nd-highest scoring win of the tournament, a 15-rune GnAE won in only 23820 turns. p0werm0de followed close behind in 3rd place with a 15-rune VSNe won in 25781 turns. p0werm0de also had the 2nd and 3rd fastest wins of the tournaments, both Deep Dwarf Fighters, with his best won in 40 minutes. Additionally p0werm0de had the game with the 2nd-lowest XL for fetching a rune that wasn’t Abyssal or Slimy with an XL 14 OpTm of Jiyva that nabbed the Decaying Rune and later ascended. First place in that category was Sukerboh, who’s XL 12 SpEn picked up the Serpentine Rune with 1 HP and lived only 26 turns before being taken down by a Naga Sharpshooter. Third place in this category was SriBri whose XL 14 MiBe picked up the Barnacled Rune only to be sniped by a Satyr less than 500 turns later. Finally, p0werm0de was the first player to complete all 27 levels of a Ziggurat just 3 hours into the tournament, followed by gorglomux and Anonymous1 the next day. tself55 had the first win of the tournament, a MiBe won just 1 hour, 24 minutes in, followed less than 4 minutes later by Likado‘s DDFi and a minute after that by NormalPerson7‘s MiBe. For combo high scores, Monsterracer had the most with 15 (only one of which was a victory! ), followed by stickyfingers and Rubinko, who both had twelve. Rubinko was also the second player to kill all 76 unique monsters, followed by Yermak. 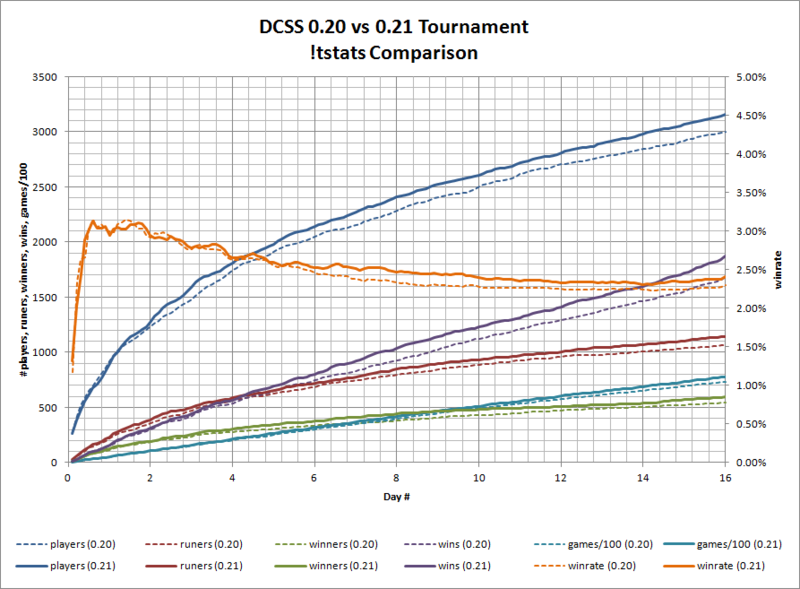 Lasty was the first to achieving this milestone 7 days into the tournament. Finally, inmateoo had the game with highest AC+EV of the tournament, a GrFi with 82/49 AC, aided by +12 crystal plate armour, the ring of Phasing, and even a molten scales mutation. The most commonly achieved banner was once again The Shining One’s Vow of Courage I, to kill Sigmund before entering the Depths, earned by a whopping 1747 players! The most rarely achieved banner was Beogh’s Heretic III, earned by no one (it was earned by two players in the previous 0.20 tournament). The most dangerous ghost was isock, who claimed the lives of 52 players, easily eclipsing slep in 2nd place with 28 kills. isock was also competitive in the “most deaths to uniques” category. Both isock and p0werm0de died to 23 distinct uniques, behind komo4ek, who managed to die to 26. The most lethal monster in this tournament was again the unstoppable gnoll, ending the hopes and dreams of 4104 characters and taking over 5% of all kills. The most lethal unique was again Sigmund, reaping 1640 characters with a kill ratio of 15.6%. Over 3,100 players participated this year! 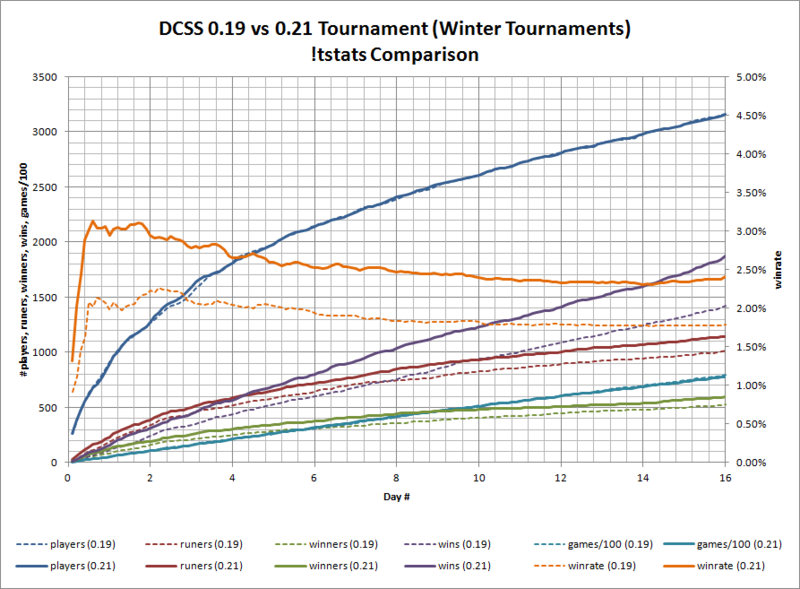 See here for a comparison of this tournament to the 0.20 summer tournament, here for a comparison to the previous winter tournament for 0.19, and here for an album of all past tournament stats images made by johnstein. The win-rate increased to 2.41% from 2.3% last year, which is in-line with the typical win-rate increases we tend to see every release as the player-base gets better at the game. We were a bit worried that tournament participation would be down due to the far later start time, but participation was instead very strong. Over 16 days, you all played nearly 78,000 games, collected over 17,700 runes, won 1,877 games and racked up 4 years, 261 days of total play-time! We on the Dev Team had fun making all the new content and quality-of-life improvements in 0.21, and I personally have enjoyed making the most commits I’ve done in a release so far. Additionally we’ve had some major features merged after collaboration between Dev Team members and outside contributors. We’ve also had lots of good feedback and bug reports from play-testers. Once again, thanks to everyone participating in the tournament! We hope to post a bugfix 0.21.1 release soon that contains all the fixes we made after the release. 5 Responses to "0.21 Tournament Results". Great event and great writeup! Thanks for running the tourney and the nice write up! Poor Lasty, names an entire clan after himself but they finish just outside the top three so they don’t get a mention. Thanks for another fine tourney and all the hard work from the devs and others; I hadn’t played since August last year but this got me back into the wonderful game I just can’t shake.